I’m also happy to share that the new store offers much better shipping times than I was able to offer in the past. The new designs are based on some of the most popular memes I’ve shared on social media. My personal favorite is the “Peace Love Music” one. 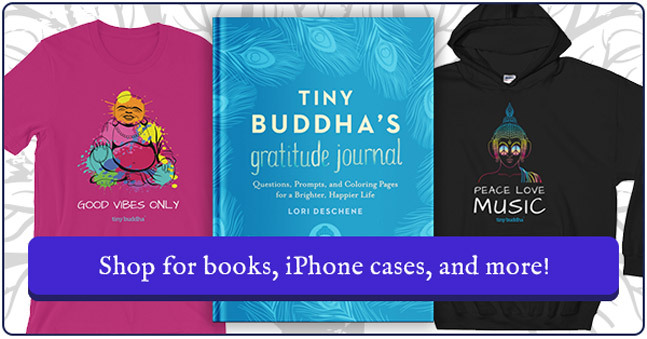 You can grab a shirt or iPhone case for yourself or someone you love, or one of the five Tiny Buddha books (including Tiny Buddha’s Gratitude Journal and Tiny Buddha’s Worry Journal) by clicking the button below. Happy holidays everyone! **Please note that this a busy time of year for shipping companies, and shipping times vary based on which option you choose. I recommend ordering before the 7th if you’re purchasing items for holiday gifts. The post New Tiny Buddha Shirts and iPhone Cases, Just in Time for the Holidays! appeared first on Tiny Buddha.